Here I am attaching most of the research material I have obtained through interviews with a MD and a RN in oncology. Unfortunately most of the medical information, dialogue, terminology, and methods of treatment were not used in the story as I shifted the project towards a more dramatic narrative than an informative film. But the information did however help shape who the characters in the film were and what they had to deal with. Below I am providing links to the original screenplay. The storyboards for my thesis film can be found in the “Storyboard” Section of this website. I have finally completed my thesis project and I am ready to present it to the school committee. Below are screenshots from the film followed by my reflections of the project. I look back to the very conception of this idea. Prior to enrolling at USC, I wanted to break away from creating action or comedy based work and I wanted to try creating dramatic work for once. Research is a big component of the ideation process and I wanted to be more mindful about the types of film I would make by being more informed and more accurate with my creative decisions. I also wanted to refine my sense of cinematic understanding because I felt my previous undergrad and freelance experiences lacked a sense of professional quality. 1. I want my character to face an obstacle that cannot be defeated and must struggle with their mortality. 2. The character goes through a period of strife and has to learn how to accept or understand his/her outcome. 3. I wanted to add a fantastical element to the film which involves either dream-like surreal imagery or heavy religious/supernatural contemplation. 4. I wanted to try animating a female lead. During the past one and a half to two years, I struggled with the story I wanted to tell. On one hand I wanted to make a statement about religion, humanity, fear, and mortality. On the other hand, I wanted to make a film that was easily accessible to general audiences. I ended up leaning towards a more general appeal. Over the course of the semester after many changes to the story, I do feel bad about not making the edgier controversial type of film, but I guess I learned to accept it. Most of the mood and tone of the whole piece was due to my own general mood and attitude towards the 2nd half of the graduate program. The work itself was stressful but my social environment with the peers in my class has taken the most toll on my morale during the last two semesters. At one point I felt the project has been changed so many times based of the advice of others that I felt it really wasn’t what I originally intended. But in the end, I am definitely better at formulating stories for the screen and my skills in animation have definitely improved since I started the program. And I guess that’s really all I need to feel happy about even if I find it hard to be enthusiastic about a film that is not only heavy in subject matter, but was also heavy in the amount of stress it caused to finish it. All in all, it was a harrowing but rewarding experience and I hope the faculty enjoys it. 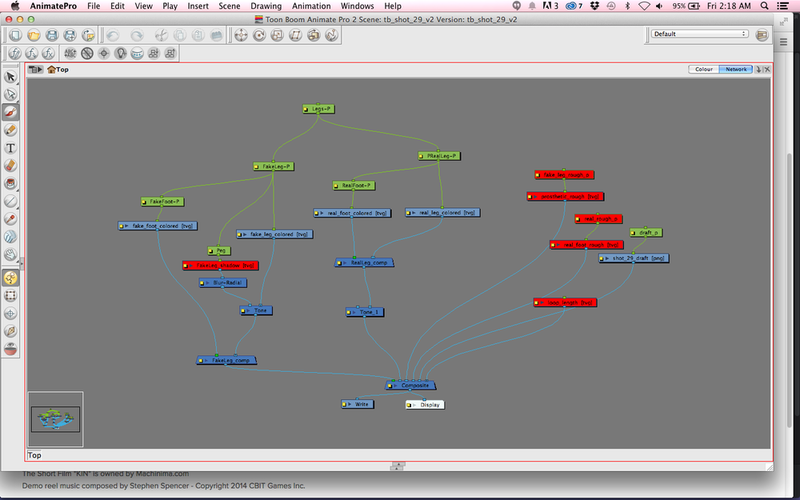 It’s the final stretch for my graduate school thesis project. I have about 2 more weeks to finish my film before submission. 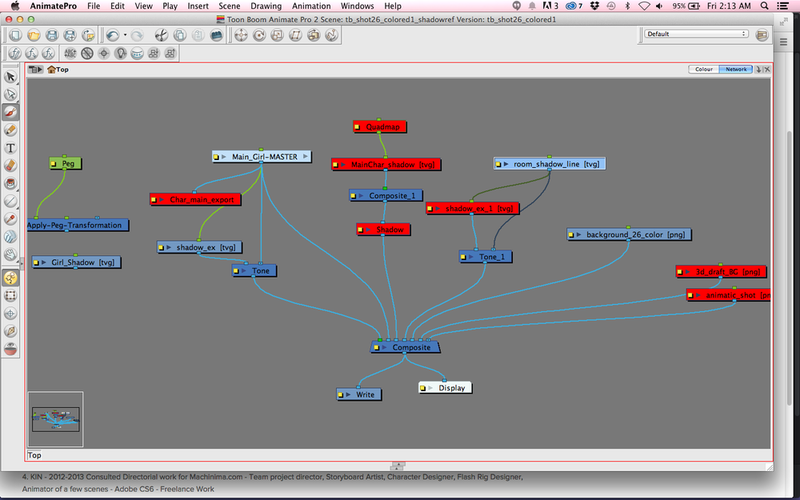 As of now, I am done animating and coloring all of my assets and all of my sound design and music has been completed. All I have to do for the next 2 weeks is to add shadows to the rest of my shots and to composite everything together. I also need to think of a title that works but so far nothing sticks. I can finalize the title leading up to the day before the deadline, so I am just concentrating on the finishing touches. If I can finish at least 7 shots a day worth of shadows I can have enough time to comp everything together. 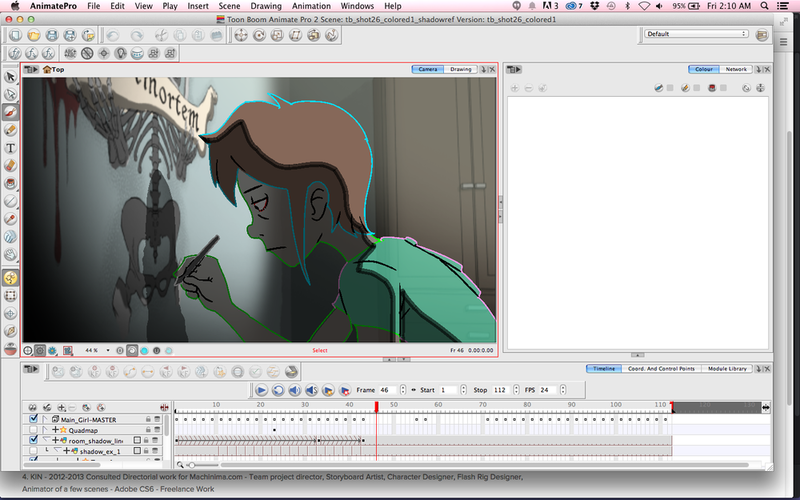 Below is a test of a scene I worked on involving effects found in Toon Boom Animate Pro 2. This shot is without shadows and a camera movement which is what I will get to soon. I’ve completed the first pass of coloring all of the characters in my thesis and now I am moving onto adding shadows and lighting effects to each character in Toon Boom Animate Pro. I’ve also completed most of the backgrounds but I still need to animate a few non-human elements. Below are a few examples of how I will apply effects to the animation via Toon Boom’s network system. This overall process should be completed by May 1st, about 2 weeks before the submission date. 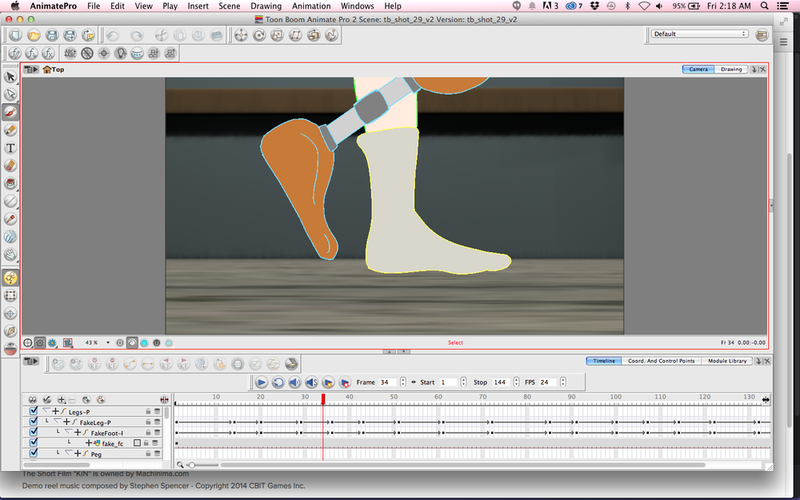 Below is an example of how I arrange the network for a rigged puppet like leg with a frame by frame animated leg in the same shot. So for the past month I’ve been doing the first pass of color and clean up. So far I am almost at the half way point of coloring the animation. A total of 36 out of 73 shots are colored without shadows. I aim to be done with this phase by the 2nd week of March before Spring Break. Other than coloring and clean-up, I’ve been having meetings with a sound designer and a composer and they will be able to start working on my film in early March. 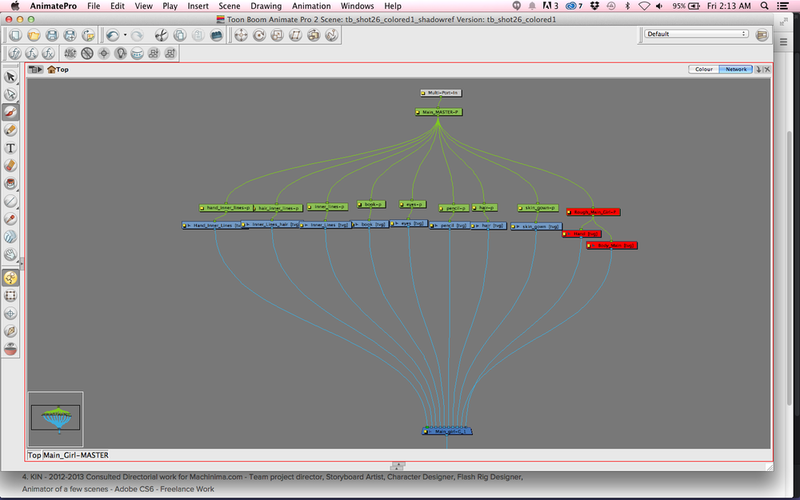 So far everything is running smoothly, but I also still have to think of a better title for the piece. It’s been a long while since I’ve posted anything about my graduate thesis film. An animatic of my film can be found in the animatic section of this website, but after a semester of rough animation I am posting up my current cut before it goes into coloring/clean-up. Tweaks to the character movements and acting will be done in the clean-up phase. Note: Copyrighted Temp sound is used on the cut as a placeholder.